November 4, 2015: Thanks to all the Rocky Mountain Tiger scholarship donors and alums who came out to our exclusive reception to welcome to Denver–Mizzou’s great–and Broncos No. 1 draft pick, Shane Ray! Proceeds from the event and the auction help us send Colorado kids to Mizzou. 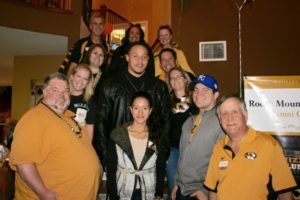 Shane was joined by his mom, Sebrina, and his girlfriend (and Mizzou alum), Sam. Shane and Sebrina are the newest members of the Mizzou Alumni Association.